I’ve gotta say, not that much snacking was done on Father’s Day. Sorry Jen. I thought Father’s Day is a perfect day to record my day’s eats though. Any holiday is fun to record the day’s eats. Without further ado, here are my eats that took place on Sunday, Father’s Day. 11am: Breakfast consisted of iChoice Meal Replacement shake blended with some frozen strawberries and a few drops of lemon NuNaturals stevia. Yogi Passion energizing tea on the side. 2pm: Got to the parents’ house! I LOVE that we have a garden! Plus they had a big box full of blueberries they bought just yesterday so I went ahead and made myself plain greek yogurt mixed with cinnamon and vanilla NuNaturals stevia. Added blueberries and our own raspberries in the mix. Delicious. 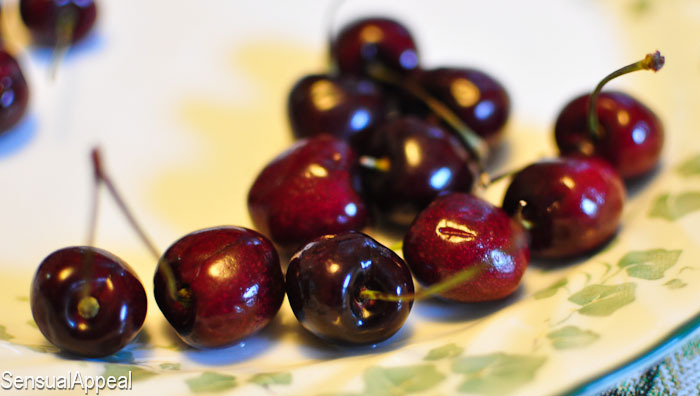 3pm: A few cherries for a snack, along with some more berries 🙂 mmm I’m a fruity monstaah! 6pm: I just finished making the amazing (I’m so humble, hahaha) chocolate cupcakes with vanilla pudding filling and chocolate frosting and I had to try one of course! 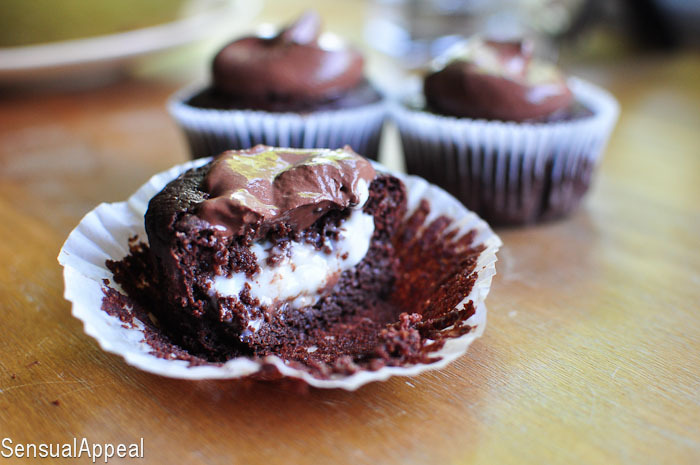 I freaking loved the result, especially since one cupcake is only a measly 120 calories and 4g of sugar! Mmmm I love healthy desserts. 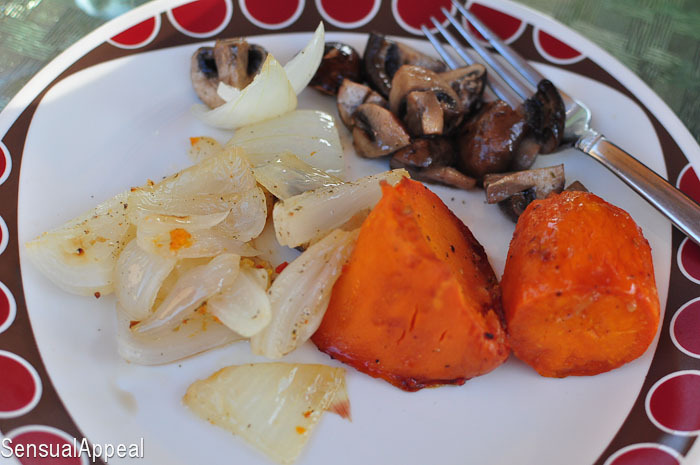 7pm: We made BBQ for dinner and I opted for half a sweet potato along with grilled onions and mushrooms. Organic BBQ on the side. 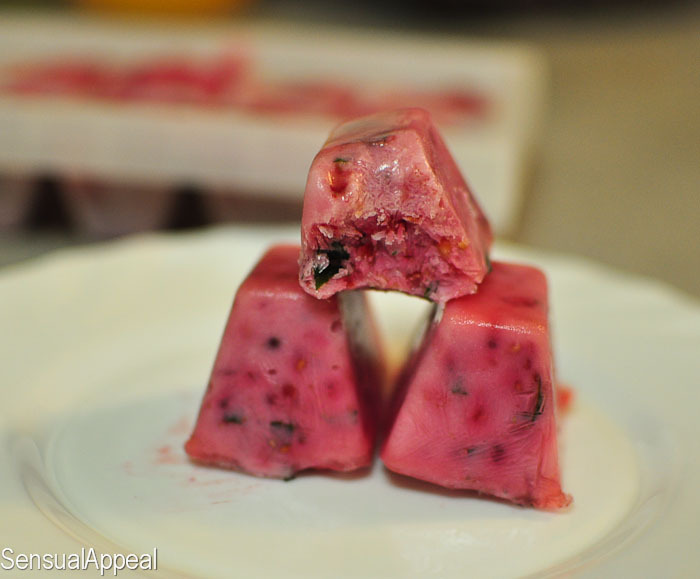 9pm: Had to have some of the raspberry mint yogurt bites I made as well. Gotta love simple treats. It was still hot outside so this did a great job at cooling me off. Oh so, today is the start of the 10 day Sugar Free Challenge created by Alex over at Spoonful of Sugar Free. Mmmm…all the berries look delicious! I swear, I could live off of those things! I’m eyeing those cupcakes…they look amazing! Yummy! Those berries look super delicious! I’m hoping my strawberries look as good as your raspberries! Yum, fresh berries! Good luck with your no sugar challenge! You’re lying. Those cupcakes can’t look that delicious and be that healthy. Oh my god, I must make them. 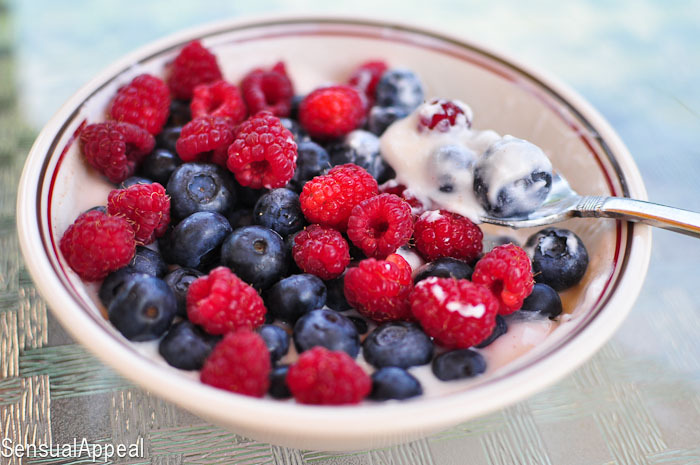 those berries look amazing, although i notice you eat quite A LOT of fruit in a day! i am not a big fan of sweet things and too much fruit counts as too much sugar for me! I am all about the savoury and salads! Those chocolate cupcakes are pretty! wow those fresh berries look AMAZING!!! The cupcakes look delicious and the berries are so pretty! I am so in love with fresh fruit and berries right now! Can’t. Get. Enough. BTW, my daughter’s name is Cami 🙂 Love the name!! Mmm the yogurt bites sound good to me… nice and refreshing and perfect for summer! Good luck with the challenge!